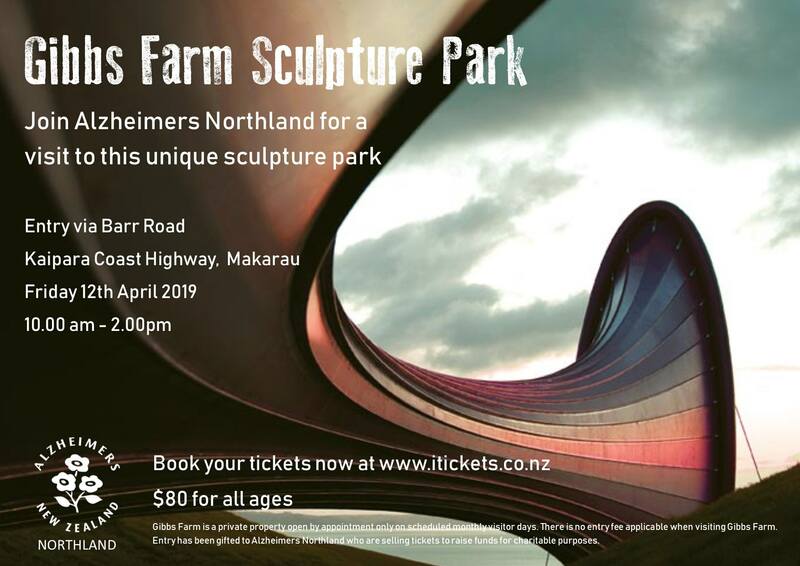 Join us for an extraordinary day at Gibbs Farm to raise funds for Alzheimers Northland. The celebrated Gibbs Farm is a breathtaking open-air sculpture park located besides the largest harbour in the Southern Hemisphere – the “mighty Kaipara” The park has 21 commissioned large-scale outdoor sculptures, the greatest collection of its type in the country with works by some of the world’s most renowned artists. You will roam among the sculptures and come face-to-face with some truly exotic animals. For your own enjoyment, health and safety at the event; please ensure that you read the full details in “Terms and Conditions” link above. What to bring: Food and water, good comfortable walking shoes, and be sun safe. There are no catering services on the farm. You must use the Barr Road entrance of Gibbs Farm and present your ticket to an event representative.